Banc de Binary demo account? Are Banc de Binary a Scam? Banc de Binary have closed and are no longer trading. This broker is no longer accepting new customers. The sales method known as “upselling” has ultimately damaged their reputation and business. Brokers operating similar models will hopefully take heed and provide higher levels of customer service in order to run sustainable operations. Banc de binary ‘eu’ are one of the largest binary options brokers in the world. Their global brand name is what sets them apart from other rival trading brokers. They provide binary options in 180+ assets in over 30 countries. They cater for traders in more than 80 different countries around the world. Their mission statement is “simplicity pays“, and that tagline is central to the business. Banc de binary still pride themselves on their customer service, despite their growth since 2008. From one to one tuition to video tutorials and e-books, Banc de binary offer as much help as a trader requests. Complaints about the firm however, stem from account managers who encourage large deposits, and often over trade, or suggest clients to. As ever in binary options, it is always best to trade yourself. Never let anyone trade on your behalf. Signals service – Yes. This forms part of Silver or Gold account packages. The Banc de Binary platform offers a fast, user-friendly method of trading options. Spot Option backed, the trading area delivers clear layout, all the key data can be easily found. The top of the trading platform is where traders can select the asset, the expiry time they wish ti use, and the size of their trade. Updating these will change the price graph, and trading buttons with the up to date data for that asset and expiry. Changing the trade amount updates the ‘projected payout’ figure too. The trading platform provides a clean, organised area. Banc de Binary are regulated by CySEC (License 188/13). They are also registered with a number of other organisation including the AML in France and the FCA in the UK. They are not regulated by those bodies however, merely registered with them, which is not the same thing. Any trader disputes would need to be taken up with CySec. The firm offer a good selection of binary option types. Binary Options – The traditional Up/Down options. Will the asset rise in value, or fall? 60 Seconds – The 60 second options work in the same way as a standard binary option, but the expiry times are very short – 60 seconds or less. Pairs – Which of two assets will rise in value most? The pairs of assets will generally be in the same asset category, for example Google versus Amazon, or Gold versus silver. Long term – Long term options follow the same principals as standard binary options – but the expiry periods are over long time frames. Anything over ‘end of day’ expiries are classed as long term. When Banc de Binary generate complaints, it generally revolves around the practice of ‘upselling’. This is where an account manager from the firm, will contact a client and offer them advice. This advice can often lead to large deposits, and pressure on the client to trade beyond their means. It very rarely ends up profitable for the trader – much the opposite. The brand offer a good trading platform and educational materials, but traders must beware of any account managers and ensure they take responsibility for their own trading. Never let anyone else trade on your behalf. As an ‘over the counter’ broker, there is a clear conflict of interest where anyone from the firm offers to trade for you. Banc de binary offer a free mobile trading app. Delivering full access to all areas of the full website, so traders can trade on the move and ensure no trading opportunities are missed. The app is available on iOS (iPhone and iPad) and android. The trading area appears more or less the same as it does on the web based platform. Live charts are also available via the mobile app, designed thoughtfully for smartphones and tablets. A responsive design means the charts display well regardless of the device used. Account management features are also available on the app. The mobile app delivers a great user experience and is fully functional. Returns are 86% on most options. Payouts will vary depending on the asset and the expiry time of the trade. The percentage may also move depending on trade volume. The returns on the more popular assets are good compared to their rivals. Payout comparison can sometimes prove difficult, but BdB do pay a fairly consistent level across all assets. Deposits at Banc de Binary are secure and robust. There is a deposit option on the right of the login area, visible once a user logs in. Once confirmed, deposits are available to trade immediately. There are a variety of deposit methods to choose from – credit card, bank wire transfer (international or domestic) and Skrill. Any withdrawals are generally returned via the same route that a deposit was made. This is a common policy throughout binary options brokers, and is a measure against laundering. Withdrawals can be made anytime, but there is a minimum withdrawal figure of $50. The broker will always require some proof of identity before authorising any withdrawal, again this policy is fairly common with binary firms. These delays are sometimes the cause for disputes, so proof of ID is best sorted out as quickly as possible after opening an account. Both documents will need to show the address of the trader. Once received, withdrawals will then become. When using a credit card to deposit funds, Banc de Binary need an image of the card (both sides). These steps are required by the regulator in order to protect traders, and to ensure their funds are separated and protected. Withdrawals should be sent out in 5 working days. There is no charge or fee for any withdrawals. ‘Pending’ status withdrawals can also be cancelled, this is useful if funds are needed for trading again. International reach – Banc de Binary offers trading to over 100 countries, and lists assets from over 30. 24/7 trading – Where markets are open, the trading platform will be open. Loyalty rewards – The firm offer a number of loyalty rewards to regular traders after sign up. Account Types – There are four levels of login account; Bronze, Silver, Gold and Lion Premium. Each level offers further benefits including gifts, trading alerts and private sessions with analysts. 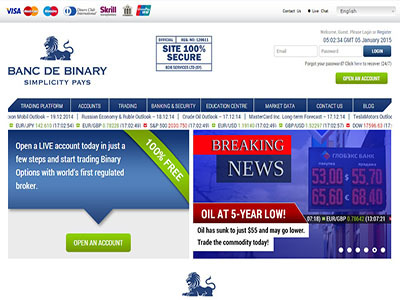 Banc de Binary offer ‘Over the counter’ binary options, and are the counter party to each trade. If they have traders on each side of any trade, they will profit regardless of the outcome due to the payout being less than 100% to the winner. Where the trade is not covered on both sides, BdB will effectively only profit when the trade loses. At present Banc de Binary do not currently offer a demo account. They are one of only a few major brokers who do not offer such a service, so we hope they will reconsider this policy soon. While the brand is not a scam, the process of ‘upselling’ has damaged their reputation. This is where account managers contact clients in order to encourage larger deposits and more trades. This advice is generally not in the best interest of the trader. This type of behaviour is rare, but traders should be aware of the risk, so that should they receive such a call, they can say “No thanks”. The withdrawals and trading platform both generate very few complaints, so if the firm were able to stop this practise of upselling, their reputation could be restored.